Why Is Coconut Activated Charcoal Superior? Gold Mountain beauty Food Grade, Steam Activated Charcoal is the perfect grain size and more porous, meaning it absorbs more toxins, easier. So whether you use it to whiten teeth, detox, or deal with an upset stomach, Coconut Activated Charcoal performs better. Perfect for internal or external use. Use for masks, cosmetics, helping digestion and calming upset stomaches. Activated Charcoal soaks up harmful chemicals and toxins within the body, and the Coconut Activated Charcoal does a superior job at this. Dip a moist toothbrush in the powder everyday to whiten teeth while brushing, or take internally to calm upset stomachs and detoxify the body. Make sure to wipe away any excess powder. We offer a Bullet-Proof, 100% Money Back Guarantee! If you are not satisfied with our premium Coconut Activated Charcoal for ANY reason whatsoever, simply send us a message and we will instantly refund 100% of your money. Our customer service is fanatical about making sure you are happy! To avoid a mess use caution when opening the bag and when using the product activated charcoal is a fine black powder. 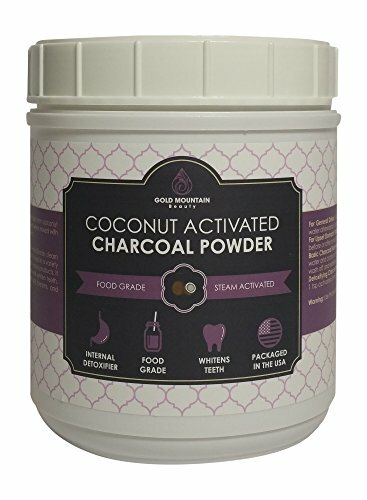 Why Is Food Grade, Coconut Activated Charcoal Superior? Our Coconut Charcoal is steam activated and the perfect grain size. It's more porous, meaning it absorbs more toxins, easier. So whether you use it to whiten teeth, detox, or deal with an upset stomach, Coconut Activated Charcoal performs better. 30 Day Money Back Guarantee: If you're not satisfied for any reason, just let us know! If you have any questions about this product by Gold Mountain Beauty, contact us by completing and submitting the form below. If you are looking for a specif part number, please include it with your message.